Do you ever dream of creating your favorite Thai dishes on your own? And have fun while learning to cook healthy delicious food? 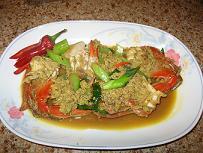 Now you can learn how to cook authentic Thai dishes from a real expert Thai chef. Let Chef Saithong help you unlock the secrets that have made Thai food so sought after around the world. Searching for something special for an upcoming birthday or anniversary? Want to do something new and exciting with your co-workers or friends? How about impressing parents visiting from out of town? 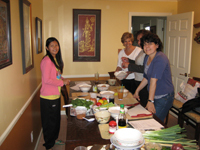 Whether it’s a girls night out, a way to spend time with your significant other, or just something new to do on your own, these Thai cooking classes are a fun way to learn and experience the joy of cooking Thai food. As you step into her kitchen, you will be immersed in the feel of the tropical land. Take a seat, sip some complimentary Thai juices, listen to traditional Thai music and take in the aroma of the Thai herbs as they permeate through the kitchen. Now you are ready to start cooking along with Saithong. Don't worry she'll explain everything and be next to you every step of the way. There's plenty of time and ask all the questions you need. Plus, there are many different Thai cooking classes to suit everyone. Beginners through experienced cooks are welcome and encouraged to partake in this culinary fun. Registration is quick and easy so once you find the classes and Thai dishes that best suit your interest, you will be on your way to find how fun and easy it is to cook delicious Thai with Chef Saithong! 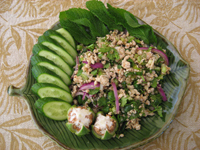 Learn to cook new authentic Thai dishes, or your old time favorites. Conveniently located in the mid-peninsula of San Francisco Bay Area near the 92,101 and 280 freeways. Classes covering over 28 dishes now available. Hands-on lessons allow you to learn by practice. 6 person cooking class size limit (except for private groups) provides personal attention from the chef. Vegetarian options are available for all dishes. Groups of 3 or more people get a special discount and can have their own private session. If you do not want to cook but love Thai food, Chef Saithong can cater for you! Check out her catering services. I do love this class and I do admire the way Saithong tries to teach us how to cook a healthy (not oily) Thai dishes. such a great thing to do on a weekend. Chef Saithong was great--such a sweet and helpful lady. 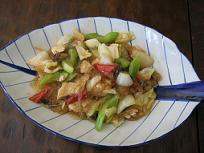 The dishes are very simple and I feel confident that I could come home and prepare them myself. For more info on Thai cooking or cooking classes, please email chef@yummythaicooking.com.